Image courtesy: Abhijit Kar Gupta. 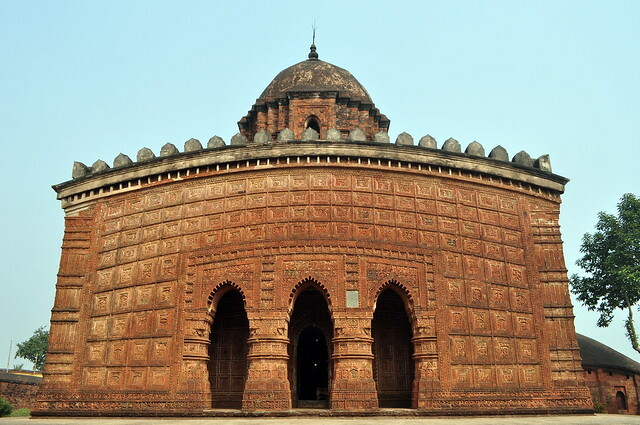 Bishnupur is located just around 150 km away from Kolkata. This is a very beautiful place equipped with some of the natural landscape. This place looks very wonderful the region is covered with lush green trees. The Terracotta temples is also a prime attraction in this place. The transportation network in Bishnupur is very nice making it more comfortable for the tourists to visit here. Bakkhali is a very fascinating place situated around 135 km away from the Kolkata. The beach here is located actually in the deltaic island. There are some of the fabulous beaches which attracts many people here The climate here becomes very beautiful, giving a very relaxing effect to many of the people coming here. The tourist have lots of fun here. Shantiniketan is a well-known place in India. It takes around four hours from Kolkata to reach here. This place is covered nicely with green trees all over. Many of the people from Kolkata and nearby areas come visit this place with full enthusiasm. The events like Basant Utsav and Barsha Mangal also pulls many people here. Mandarmani is a place situated along he seaside. This place is around 180 km from the Kolkata. This place is having some really spectacular view. This beach can simply take out all your worries and give you a fantastic energy. The sunrise and sunset look very beautiful from here. Many of the tourists visit Mandarmani from long distance. The Mukutmanipur is a very happening tourist destination the Kolkata. This place is around 250 km away from Kolkata. Mukutmainpur is surrounded with the green forest taking many of the tourists. The water flowing through this regions looks very outstanding. The dam site located here is one of the prime attraction of the tourists coming here. All these places looks very beautiful attracting many tourists. Kurseong is very wonderful weekend destination near Kolkata if you have a couple of extra days to spare because its a bit far away from the Kolkata. The large green hills are spread all around here. The monsoon simply makes the atmosphere very marvelous. The myriad tea garden like Goomtee, Ambotia, Makaibaire, Castleton looks extremely beautiful in the monsoon. The tourists come to Kurseong in large numbers to have some enjoyable moments. Digha is a very popular weekend destination for Kolkata. It is located around 190 km away from Kolkata. The Digha beach is one of the perfect destination for the friends and families to come and enjoy the holiday. The waves of this beaches simply amuses many of the people who have lots of fun. Apart from that Marine Aquarium and Research Centre is also worth watching place here. Rasikbil is a very astonishing weekend destination. Its around 450 km away from Kolkata, which a little longer distance. However, this place will surely make the long distance travel worth for the people visiting here. This place is rich with the floral and faunal diversity, which can really make the people happy. This place is very rich in various faunal diversity. Krishnanagar is a fabulous place located around 110 km away from Kolkata. It is located near the Jalangi river. This place is having some of the spectacular views. This place appears more attractive during the monsoon with amazing green trees, mountains and small waterfalls seen everywhere. This happens to be a nice weekend destination near Kolkata. Sajnekhali is a nature rich weekend destination near the Kolkata. This place is around 100 km away from Kolkata. This place is located nearby Sunderbans. The floral and faunal diversity in this region appears more fascinating here. The swift flowing water streams simply makes the people coming here happy. This is really a fantastic rejuvenating place for the people. Nice compilation! Sharing this with my readers. Interesting compilation of weekend trips around Kolkata.